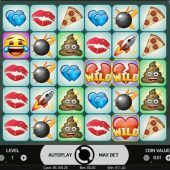 Emoji Planet slot is a result of a 'Battle of the Themes' between Netent and Microgaming, who have both made one with these annoying little characters, but alas were both beaten by Endorphina's slotomoji slot a while back. Here we get an unusual format for the game with cascades on a grid in a similar model to Play'n Go's Gemix or Cloud Quest where blocks of adjoining icons are required for wins and features can be earned. After playing this, which Emoji will we be expressing ourselves with - grin or grimace? We begin with a grid of 6 columns of 5 rows thus 30 separate tiles. Any 5 or more connecting adjacently but not diagonally will award a prize. The pays are decided by quantities of anything from 5 to 30 connected but to list the pays pertaining to a full grid of 30 would be unrealistic as that would be very rare and the top Emoticon would pay 600x bet for that. So in order to get a feel for the values it's better to look at the lowest awards for a 5-of-a-kind. 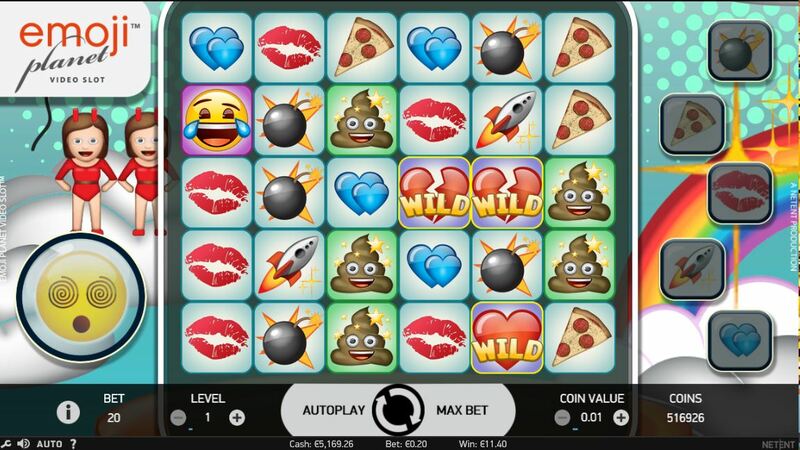 You must bet 20 coins per play and with a 'whoosh' and 'tinkle' the tiles fill the grid and a little 'thud' occurs if you get a winning block. There are no scatters and the top icon is the yellow weeping Emoticon paying 2x bet for the 5, followed by the Alien for 1.5, the Brown icon (unfortunately resembling an irresponsible dog walker left on the pavement) 1x for 5. Rockets, Kiss Mark and Pizza slice pay 0.5 and the lowest two are the Bomb and Blue Heart at 0.25x for the smallest winning block. Wilds can appear in any position too and like the other symbols disappear when part of a combination. You don't get scatters or re-spins but there are 5 Emoji Meters on the right of the grid. On any single play you need to accumulate 12 winning and therefore replaced icons to add 1 to the meter. You can fill any amount of them up if you keep getting winning tiles removed, and if you removed 24 of one tile its respective meter would have 2 on it and so-on. Once you have stopped making winning blocks you then get these feature(s) applied to the grid one by one. You also keep adding to the meters while these feature(s) are being applied so it's possible to have quite a lengthy and productive spin. Pizza Feature - a 3x3 overlay random symbol is placed on the grid, except Wild. Bomb Feature - 8 random tiles destroyed and each also awards 0.25 to 5x bet. Kiss Mark Feature - 3 random sticky Wilds appear on the reels and all remain until they have been used in a winning combination 3 times. Rocket Feature - a stack of 10 Wilds appears on one of the 5 columns and keeps descending down as they are used up. Two Hearts Feature - after all the other features are applied, or on its own, this feature multiplies the winnings by how many times you filled the Blue Heart meter plus 1.